Thanks to Dr. Trevor Sorensen, who was the Lunar Mission Manager for the 1994 Clementine Mission to the Moon, and to the late Dr. Paul Spudis (Lunar and Planetary Institute) who contributed the Clementine documentation from Dr. Gene Shoemaker's collection, the PRPDC has now acquired much of the original documentation for this mission. In August 2018, we started to digitize these materials and make them available on our web site, but we still have a long way to go! Clementine Analysis compared to Galileo mission. List of the orbit-by-orbit Clementine reports. Preliminary UV/VIS Camera Calibration for Clementine 1. Selected letters related to the Clementine mission. Agenda for the planning meeting for this second mission, held March 27th/28th, 1997. Clementine 2 Science objectives at the Moon. 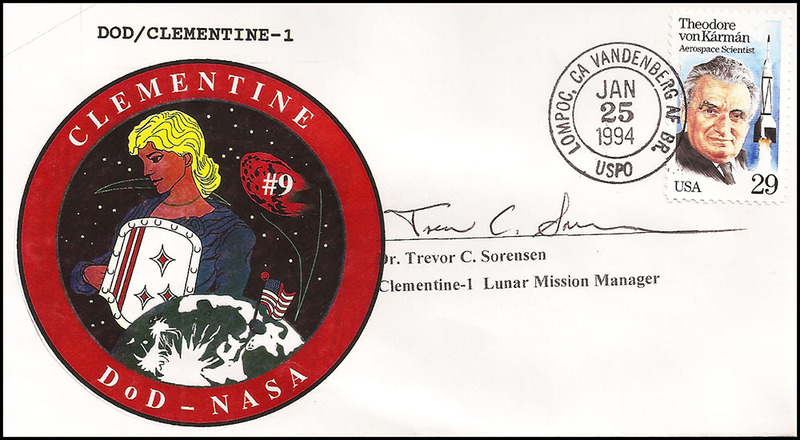 Documents describing a Clementine Mars Mission to recover from the loss of Mars Orbiter in 1992.
Letters of support for Clementine 2. Resultant Clementine 2 Science Team Report. Science Impact to Clementine II Spacecraft, Flagstaff Briefing, May 1997. Some of the view graphs presented at this March 1997 meeting. Other materials in our collection but have not yet been digitized.